This was a hard one to write and honestly a review that’s over one-hundred hours in the making. Now while I’ll eventually sit down to Xenogears, I loved Xenosaga, was ok with Xenoblade Chronicles and loved Xenoblade Chronicles X. 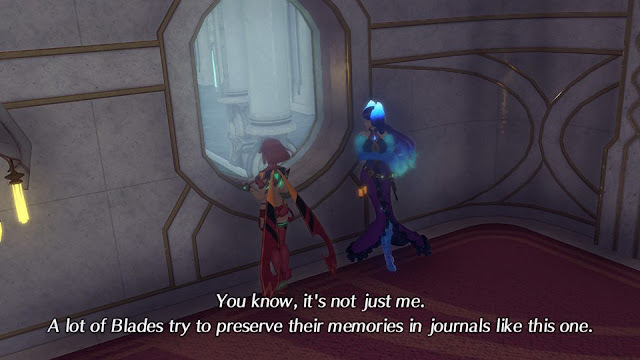 For the first thirty hours of Xenoblade Chronicles 2 however? I didn’t like it. At all. The systems felt like there was something missing in the math. I didn’t like the main character. I found that the artstyle for your main party looked childish compared to the more refined character models of your enemies and then I left it alone. Coming back to it months later, I picked up the “expansion pass”, re-reloaded it and then fell in love. I’m not sure when they fixed the math but going into version 1.50 from 1.00 (it’s at 2.0.x ish now), the math for combat was now reasonable and everything I didn’t like before was ok now. Maybe I had just expected more of Chronicles X, maybe I was looking for something else. Now? Now I’m more than happy with the result. 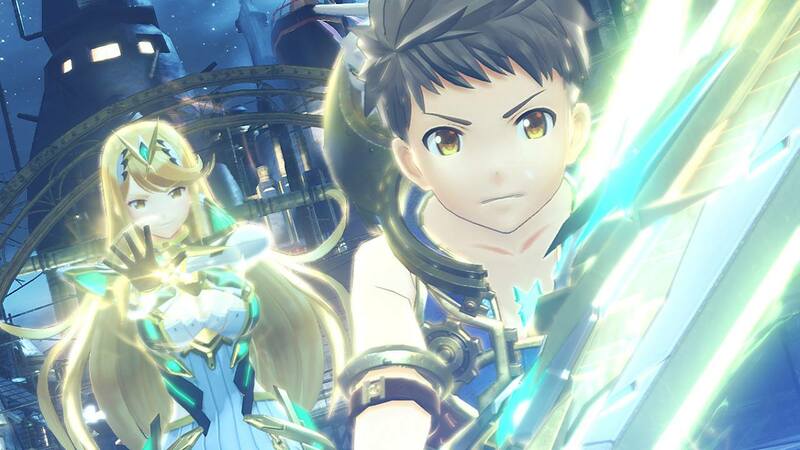 Xenoblade Chronicles 2 isn’t a sequel as much as it’s another tale side to the one in Xenoblade Chronicles. This isn’t a spoiler per say but if you’ve never played the first you wouldn't even know unless you looked up that particular segment on the internet. The story follows the journey of a young man named Rex who fishes up salvage from the cloud sea off of the back of his “Gramps” who’s a smaller and elderly Titan. Coming back from a salvage run one day, Rex is presented with a job opportunity in which the money is WAY too good to pass up. Not taking the money for himself, but instead to send home to his village as that’s why he left there in the first place, it’s not long before double crossing occurs, Rex dies, and the story starts for real. 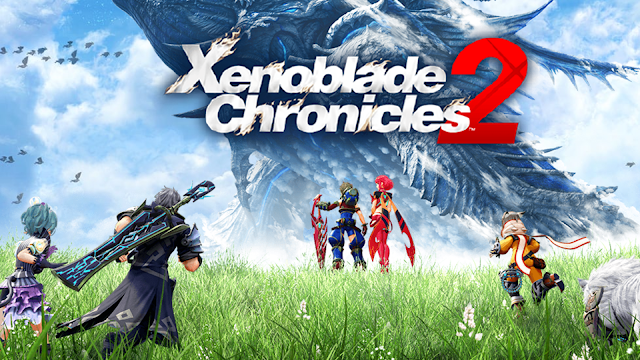 Having gone into a giant wreckage as an expert diver in order to lead a group known as Torna to what they seek, it’s not long before you find it and their leader shoves his sword through Rex’s chest dropping him to the ground. Funny enough is that if you look at the leader Jin, his character design and weapon isn’t unlike that of Jin Usuki from Xenosaga who’s the main protagonist Shion’s older brother who joins you in part 2 which keeps with the feel of this being a Xeno title. Not quite ready to give up, even being dead, Rex meets the Aegis, a Blade of immense power who’s willing to share with him her power as long as he can bring her to Elysium. Accepting her proposition, Rex is brought back to life alongside Pyra waking up from a lengthily sleep at the dismay and outrage of Torna. Battling again and then escaping, Rex and the start of his party head out in order to reach the final goal. Even if side quests were not to be taken into account or be a factor of time, Xenoblade Chronicles 2 is a long title. The main quest alone will take hours between explorations, cutscenes and grinding for experience because believe me you’ll need it. Monsters even just a few levels higher than you will not hold their punches. Probably because of this, side quests while often being either a fetch quest or a defeat a certain amount of monsters type, will come with story and sometimes the tale is long enough that it fits in just nicely and is enough of a distaction of the main quest to feel like it belongs because it wasn’t just about cashing in a reward. The rewards however? Completely worth it as often you’ll be leveling more off of the experience gained from a side quest than you otherwise would simply hunting monsters and keeping the kill counts rolling. A little like Final Fantasy 15 in that regard, experience from Side Quests that has been accumulated can only be used when spending the night at an Inn. Even at that, unless the experience will flat out grant you a full level, it cannot be used in order to bring you that much closer to the level up mark where you could instead finish leveling up in the field. The reverse is true however as if your party is close, quick travelling back to a town if you aren’t in a specific location that would be hard to get back to can often be wise as even with “fixed” math for battle calculations, you never want to pull anything too much higher than your level or it’ll stomp you flat. 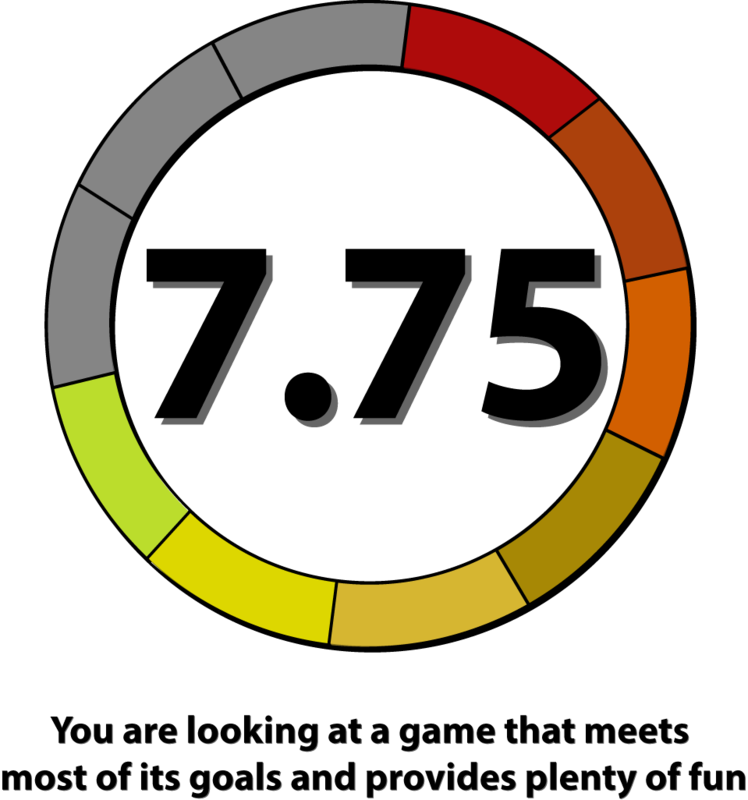 The most that I think that I’ve been able to do was a whole freaking ten levels because there was NOTHING else in the vicinity. NOTHING. Anything else coming to join? It’s not even worth trying at that point. 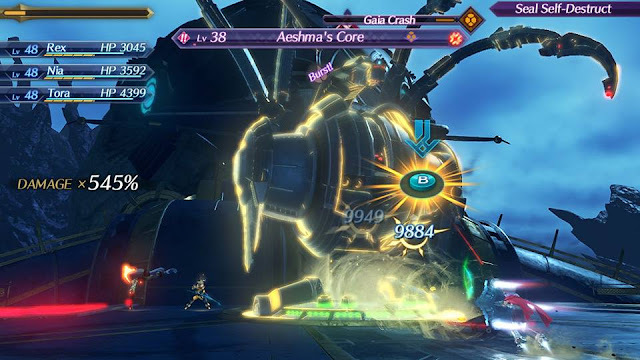 Designed in an open world concept, Xenoblade Chronicles 2 like the original and X will kill you in about two seconds flat if you’re not careful. In this “frustrating” way it emulates the “real” world in which you can simply cross over a hill and find something that will crush you into the ground ending your life. Unlike the real world however, you’ll respawn from your previous checkpoint which more often than not is a fast travel point that has been unlocked by having explored close enough to it. Like any giant open world, these points are a lifesaver because walking or running all over the place? You’d seriously lose patience which is where one of the aspects of the updates and of the new Season Pass comes in real handy. Not only has the original math been taking care of and the experience become more balanced, but you can now turn off enemy auto-attacking if you hit their agro range. Now I know you’re thinking that this is against what the game was designed as, or that sounds like it’s making it too easy, but honestly? If you don’t want to be stomped into the ground by a being twenty, thirty, forty or eighty levels higher than you? Especially when five to ten is a huge challenge? You’ll want to turn this option to “ON” as even with it on, certain beings will still attack on sight and wipe you from existence. I personally caved after twenty hours when I finally turned the option “on”. Combat is a bit of a hybrid between a real time and a turned based affair. The real time is that nothing actually ever stops and you can move around your enemies and place yourself in a position for your abilities to do the most amount of damage. In the meantime, as long as you’re on the original default 1.00 settings as my brother told me the new default is different as he just started, you’ll attack every few seconds with a standard melee or ranged attack depending upon your “Blade” which I’ll get to momentarily. 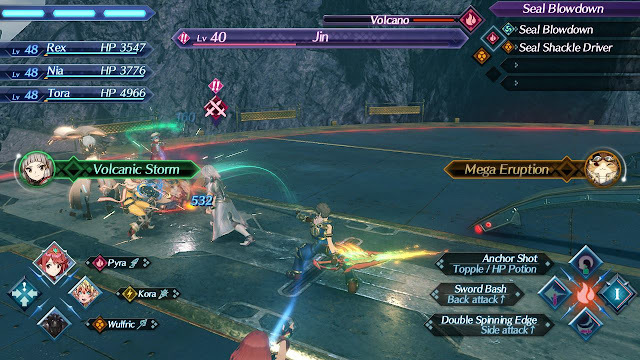 By connecting regular attacks you can fill up the gauges for your special attacks which in turn will fill up a “mega-attack” that can be performed in conjunction with your Blade. Where combat can lose a few points is that while it’s simulated to work in real time, logical mechanics such as moving out of the way will often NOT work. It works in regards to back or side-stabbing in which plenty of abilities are designed for as well as a pure head on attack, but moving off to the side or behind a foe in order to get out of the way? You’ll take the damage so often that’s not even worth it unless it’s a beam attack with a clear radius. Then you move and you move fast. 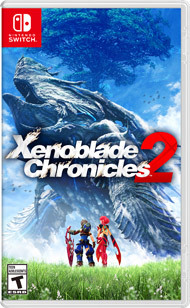 So a bit of a hit against the entire experience is that Xenoblade Chronicles 2 is a bit like The Legend of Zelda: Breath of the Wild in that its open world feels… empty. There are some side quests here and there but generally it’s stuff to pick up and off the ground or monsters to kill. Most side quests will spawn out from the towns and cities. So while good for grinding and farming, that’s about it until a side quest gets thrown into the mix which as mentioned above can be a good distraction to what you actually should be doing. That said? I wouldn’t waste too much time before moving forward not because it’s not worth it, but because a lot of features take a long time to show up and more often than not, having to learn something new or adapt thirty or forty hours in can be both glorious and annoying. A lot of your party won’t really filter in until chapter three to four and when you evaluate that forty hours was essentially getting into chapter 6? You can grind for experience to level up and it will indeed help, but it may be better to simply keep pace and get all of the features and party members sooner rather than later in order to make your life easier especially since one party member can only have versions of his artificial blade while everyone else can summon and equip the ones that you wish to keep. Blades essentially define a character’s role in battle. You have supports / healers, tanks and fighters of various types. Each of these roles is a different weapon type from swords to cannons, “blitzballs”, lances or gauntlets. Being able to equip three blades and switch between them, you’ll want to make sure that you’ve also got your elements covered on top of your physical prowess because those moves are what are going to allow to change a losing battle into a victory quick enough. Blades themselves come from cores and rely on luck in order to get the unique ones. 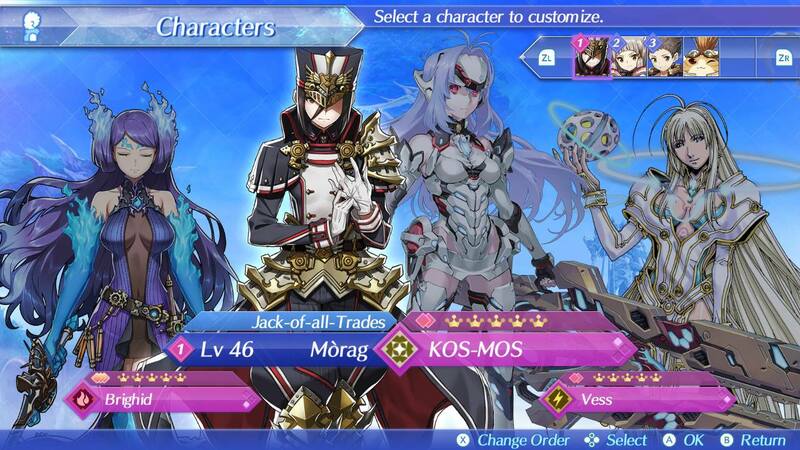 The Season Pass has added in its fair share such as Telos from Xenosaga Episode 3 to be used alongside Kos-Mos from the entire Xenosaga Trilogy… who I somehow got from a standard core when trying to get a particular bruiser type with a lance. That is also not a complaint since her drop rate requires some hefty math and cores and blah blah blah, I got her out of a common core and not even thinking about it. Talk about lucking out huh? It’s by mixing and matching these blades, upgrading them and leveling yourself though that you’ll carry on through the harder fights as the end of chapter boss battles are trough and will truly test your patience or your skills if you haven’t leveled up enough. *There was a massive power outage in my area that lasted for two days at my place and a week for others in which I propped up the Switch, plugged it into a battery and played for sixteen hours straight since I had nothing better to do… there was no power and the temperature outside was unbearable. Thankfully the air conditioned air lasted long enough to come back on because the humidity was awful!